Bringing Home the Cows, oil on canvas, 16" by 24" (image), 29" by 37" framed, signed lower left with Casilear's distinctive monogram. Born in New York City in 1811, Casilear trained initially as an engraver with Peter Maverick, eventually forming a partnership with his brother to engrave banknotes. His real love was landscape, however, and in 1831 he began studying landscape painting with Asher B. Durand. In 1833, Casilear became an Associate of the National Academy of Design and began exhibiting there, becoming a full Academician in 1851. In the company of Durand, Kensett, and Thomas Rossiter, Casilear did the ‘grand tour’ of Europe from 1840 to 1843. He made a second trip to Europe in 1858, shortly after moving his studio to the famous Tenth Street Studio Building. 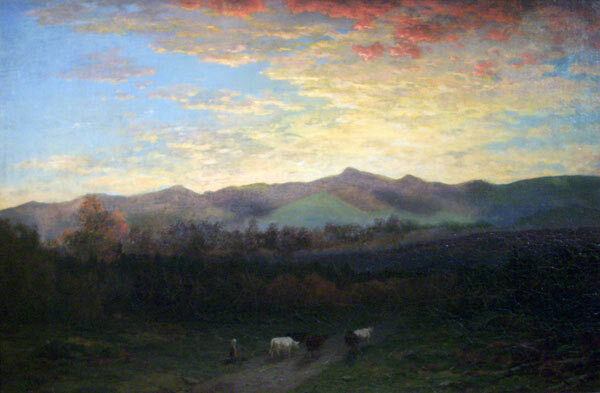 After a successful career, the painter died suddenly in Saratoga Springs, New York in 1893. Casilear’s work can be found in the Metropolitan Museum of Art, the Museum of Fine Arts, Boston, the National Gallery of Art, the Brooklyn Museum of Art, the Wadsworth Atheneum, the White House, the National Academy of Design, the Butler Institute of American Art, the Detroit Institute of Arts, and many others.